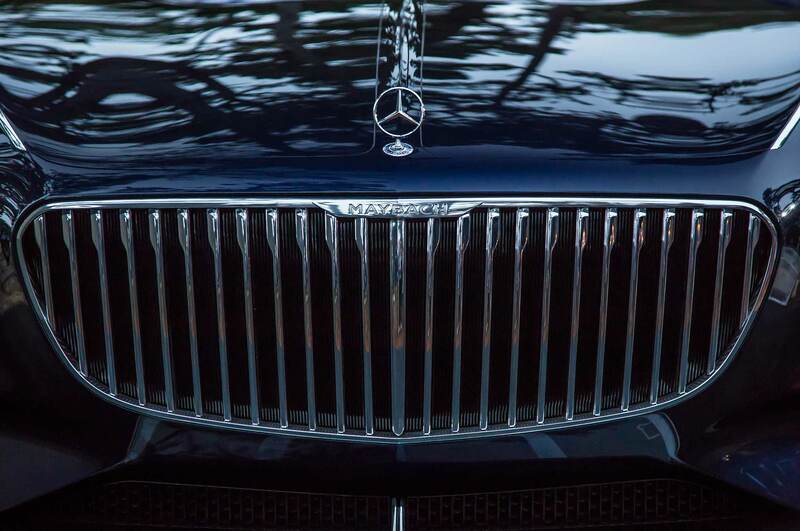 Mercedes-Benz wants to yacht rock your world. 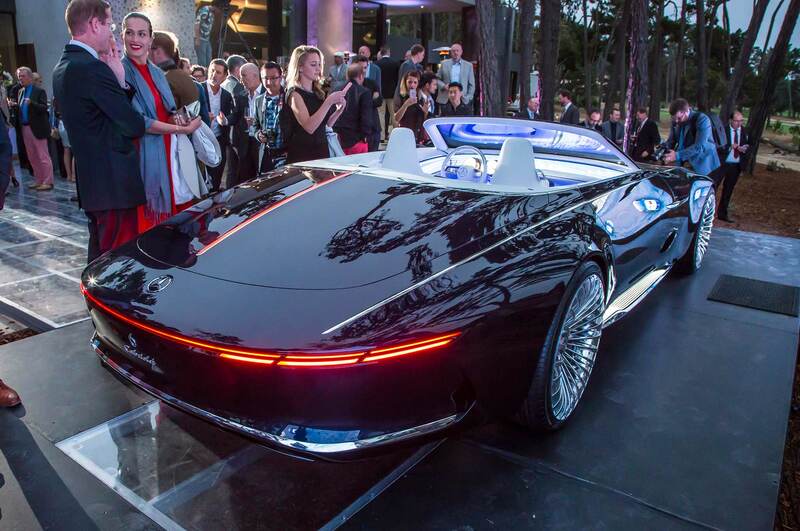 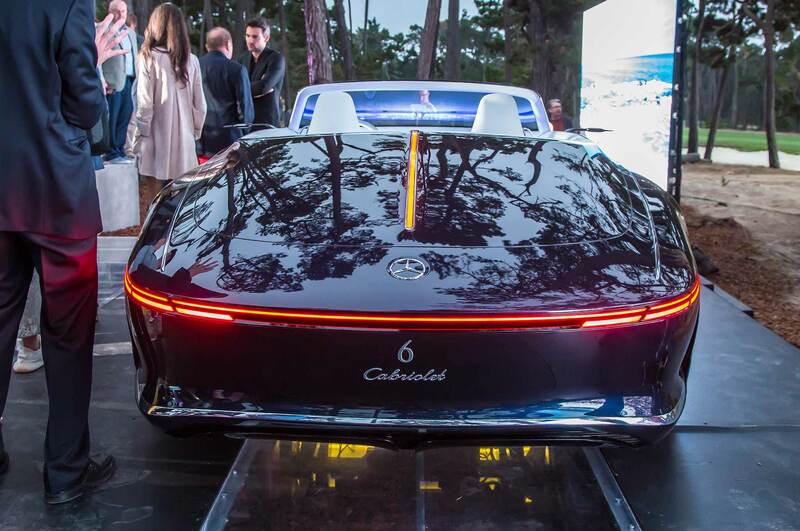 Stuttgart unwrapped a stunning electric vehicle in Monterey, California—the Vision Mercedes-Maybach 6 Cabriolet. 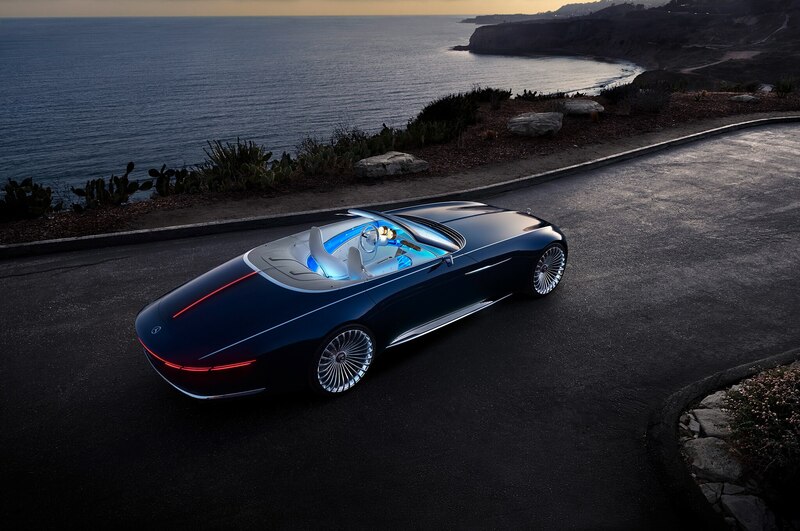 The super-haute cabriolet has an extremely long hood and in all, the dreamboat drop-top is nearly 19 feet long. 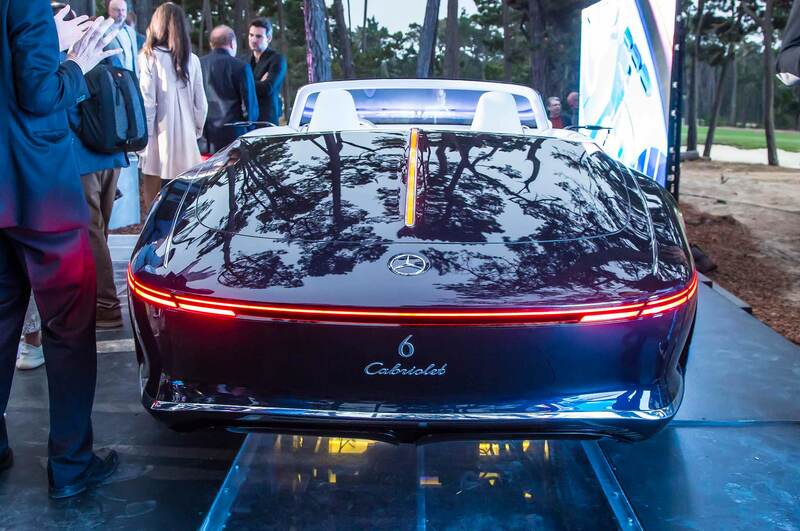 The Art Deco inspired vehicle was designed as an electric car and features a flat battery under the floor. 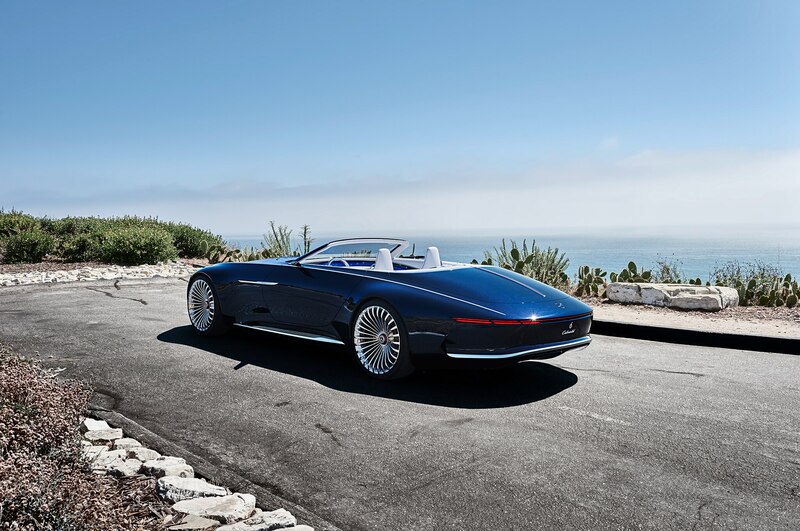 It’s powered by four compact permanent magnet synchronous electric motors and features all-wheel drive. 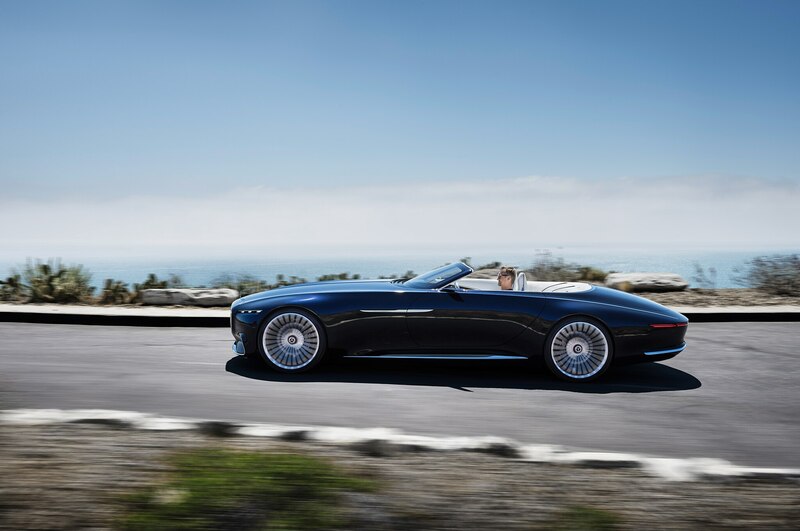 The electric drive produces 750 horsepower (550 kW) and Mercedes claims it has an emission-free range of over 200 miles. 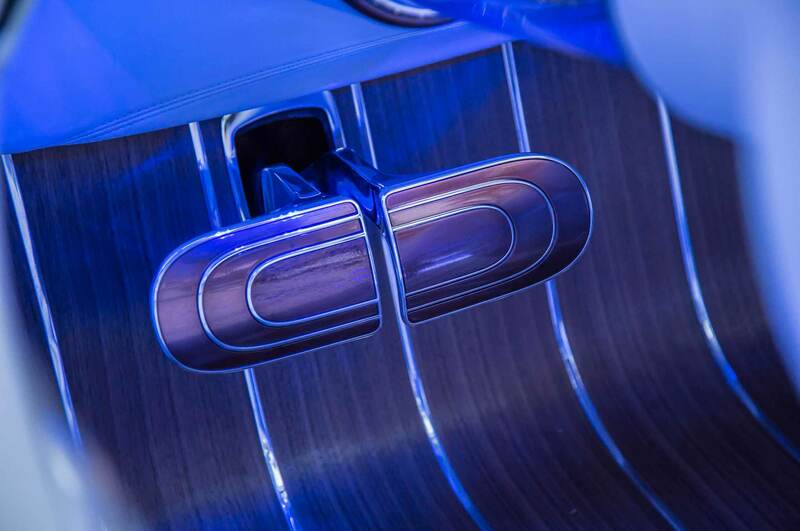 DC charging is based on the CCS standard, and it needs only five minutes of charging for an additional range of over 60 miles, according to Benz brass. 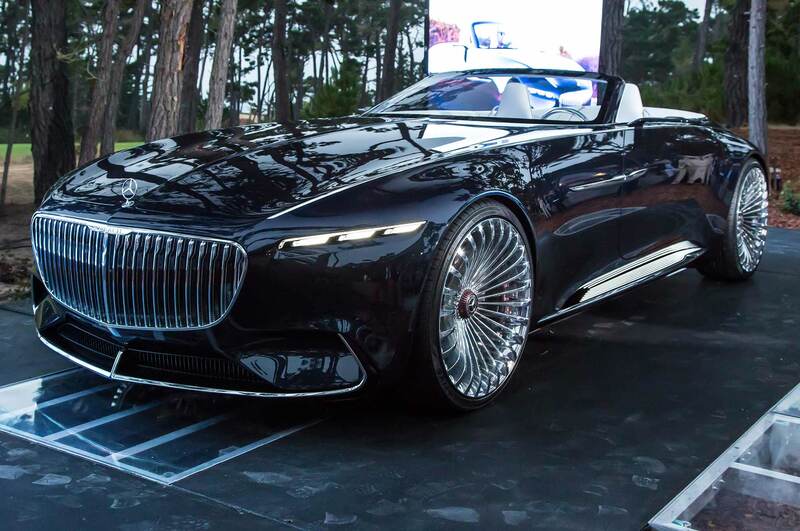 Mercedes-Maybach promises an acceleration run from 0-60 mph in less than four seconds and top speed is electronically limited to 155 mph. 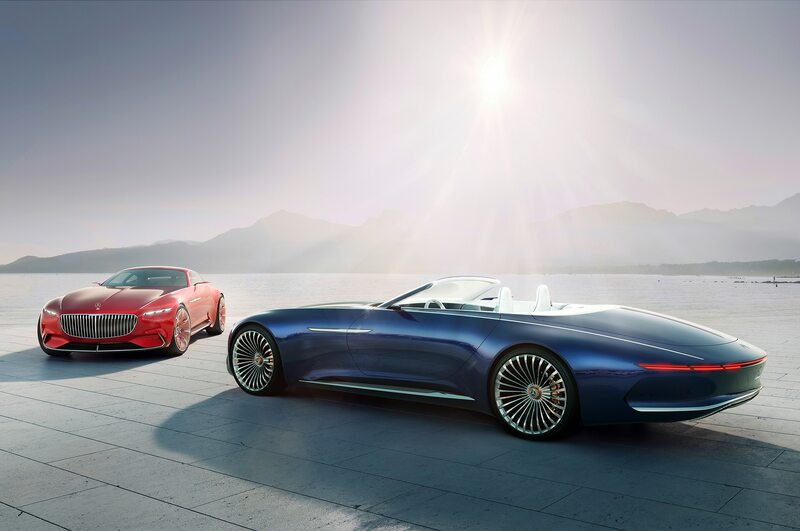 “The Vision Mercedes-Maybach 6 Cabriolet takes modern luxury into the realms of the ultimate in luxury, and is the perfect embodiment of our design strategy,” said Gorden Wagener, Daimler AG chief design officer, in a statement. 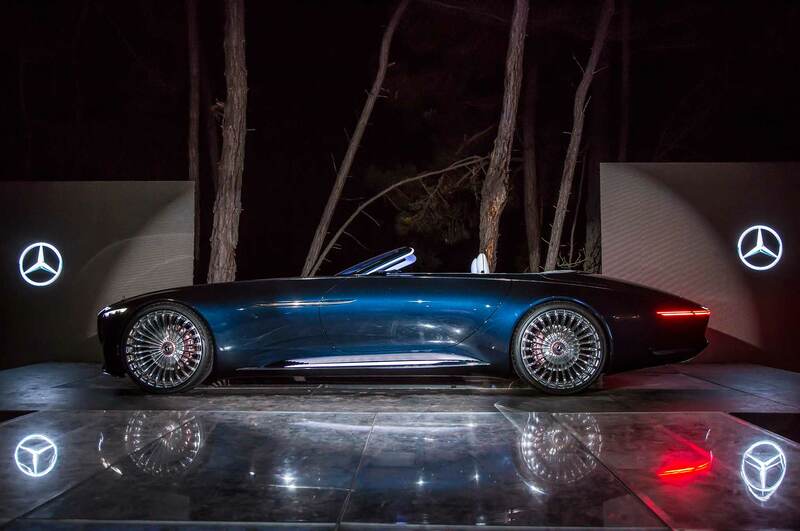 The lengthy looker made its debut dripped in nautical blue metallic paint. 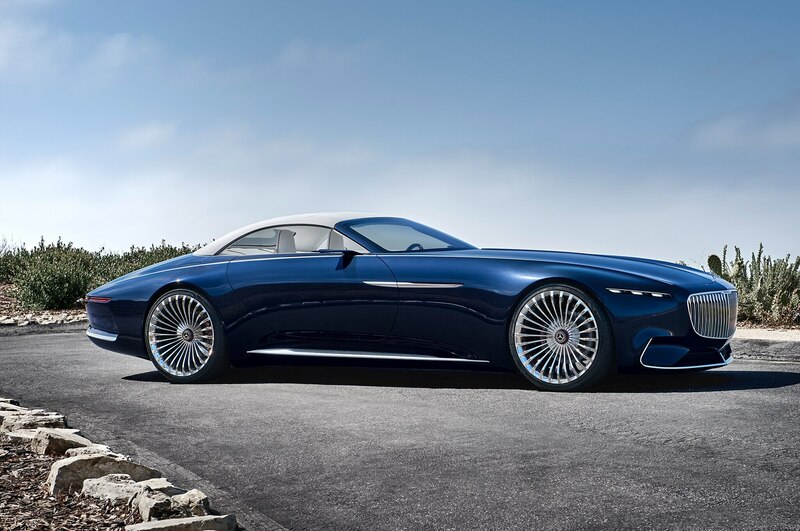 Its cigar shaped body features long horizontal lines and a stretched out profile that makes it look like a luxurious land yacht. 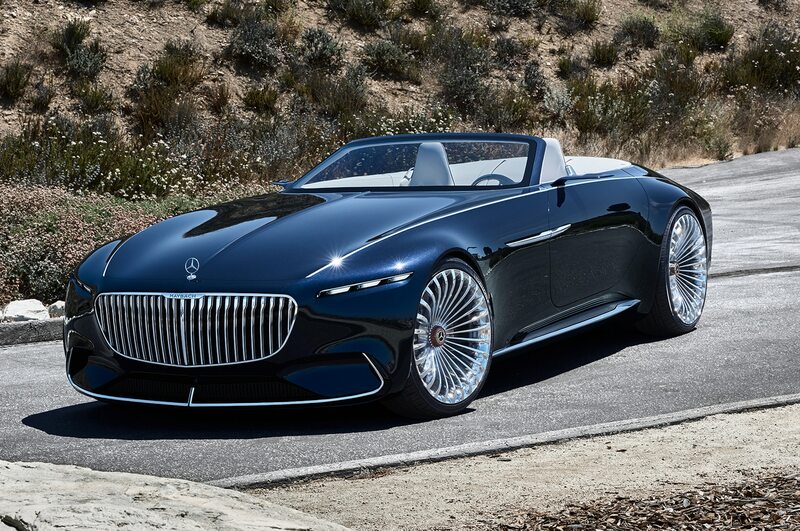 Its dimensions measure 224.4 x 82.8 x 52.8 in, giving it the footprint of a fullsize pickup truck, but a height lower than that of most sports cars. 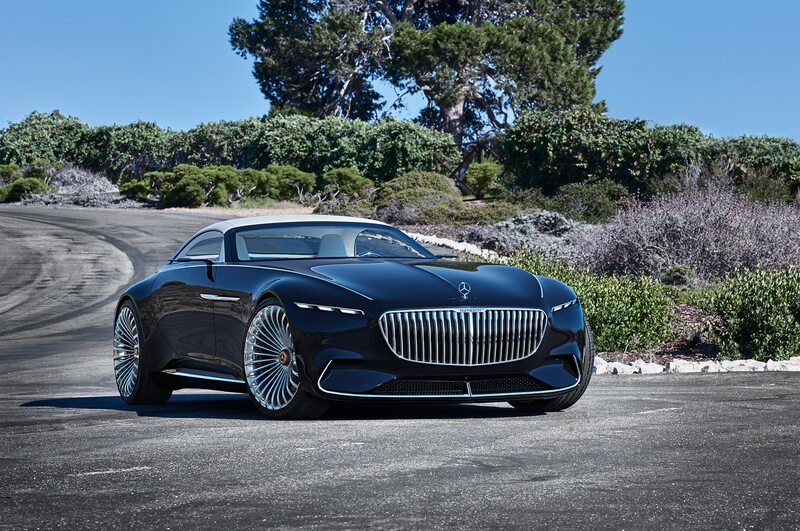 Up front, sliver-sized headlights flank a massive chrome cascading grille inspired by a pinstriped suit. 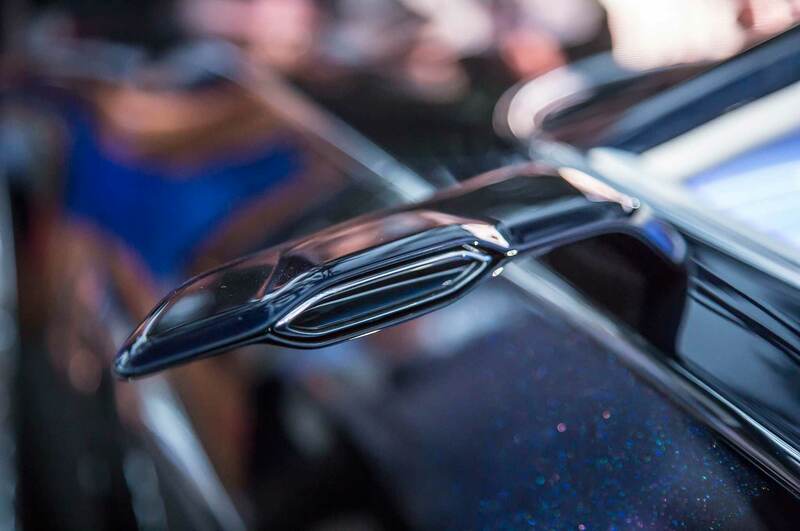 A chrome pointed star above a Maybach logo leads the way on its insanely stretched and long muscular hood. 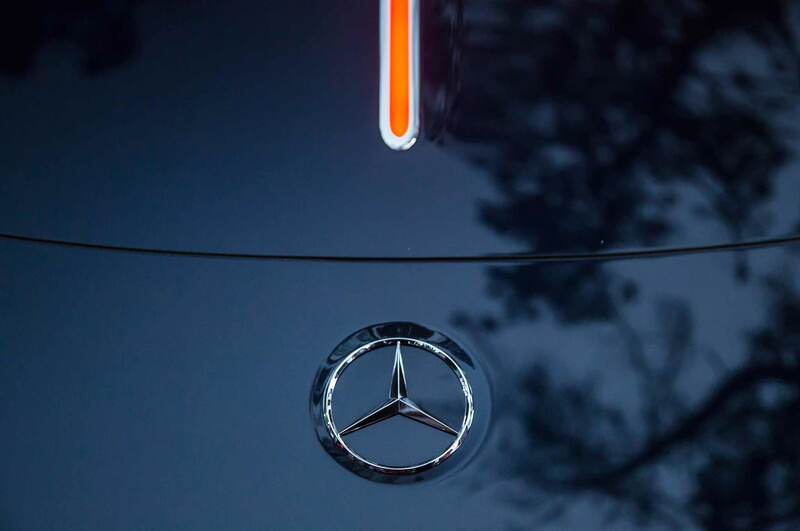 Underneath the split hood, you won’t find an engine. 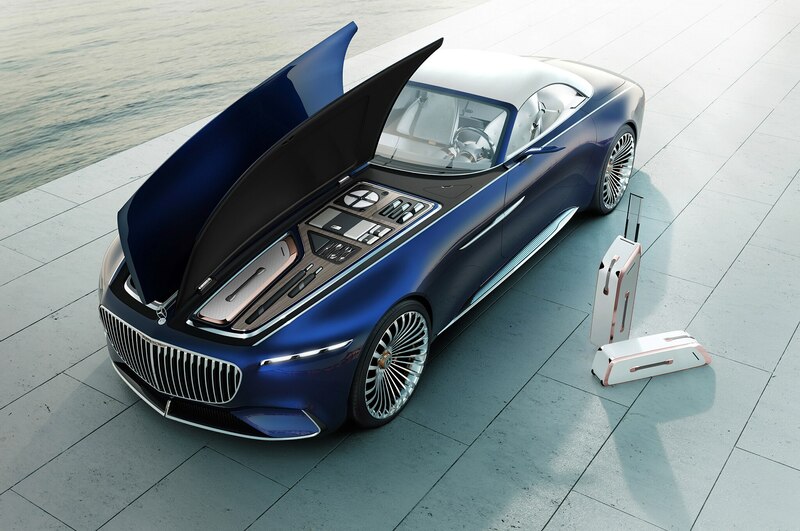 Instead, there’s a frunk with room for matching luggage, picnic utensils, and other entertaining essentials. 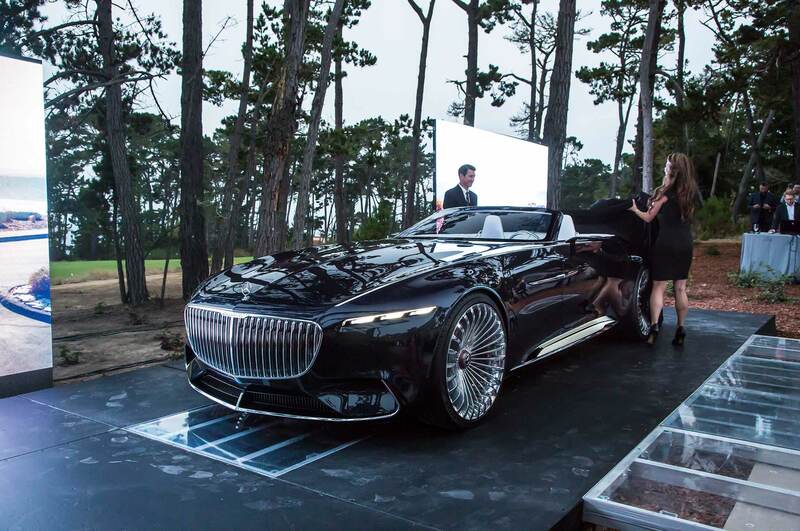 We can’t see both sides of the front bay, but there looks like enough room for a working gas grill and a wet bar, to boot. 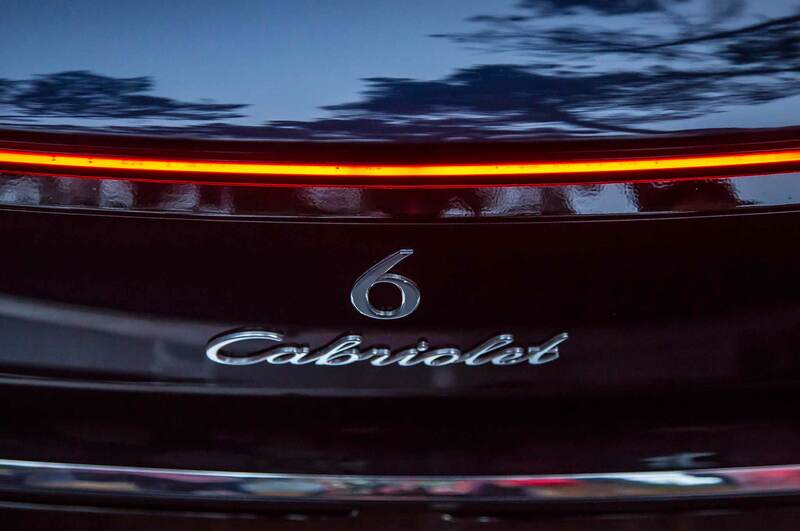 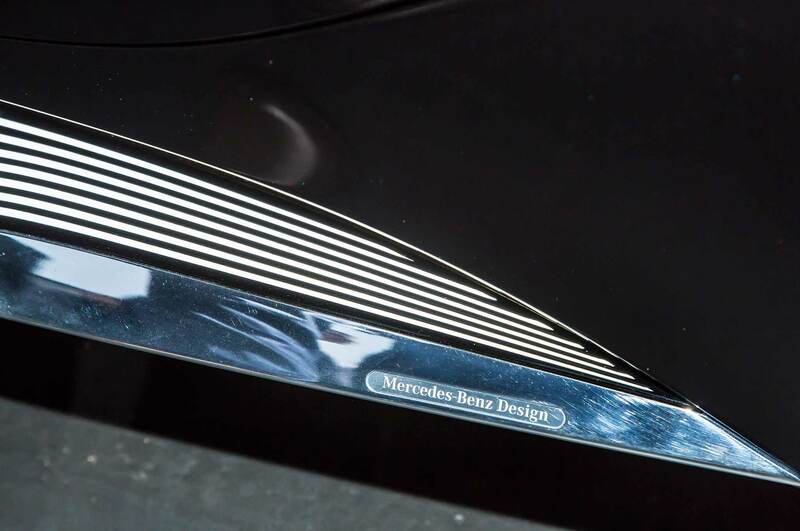 The side feature line splits the upper body from the top of the grille across the entire length of the vehicle to the slanted “boat tail” rear. 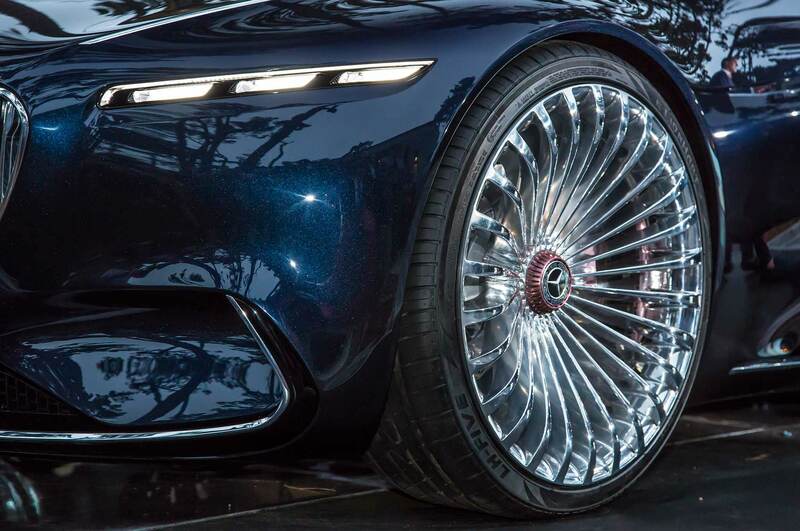 It rolls on 24-inch light-alloy wheels that feature a center lock painted in rose gold. 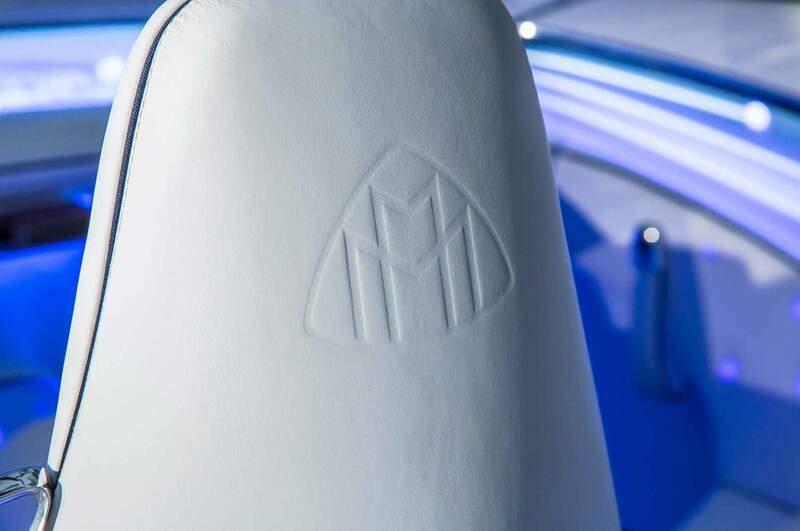 The custom-made fabric top is also interwoven with rose gold threads to coordinate with the rest of the cabriolet. 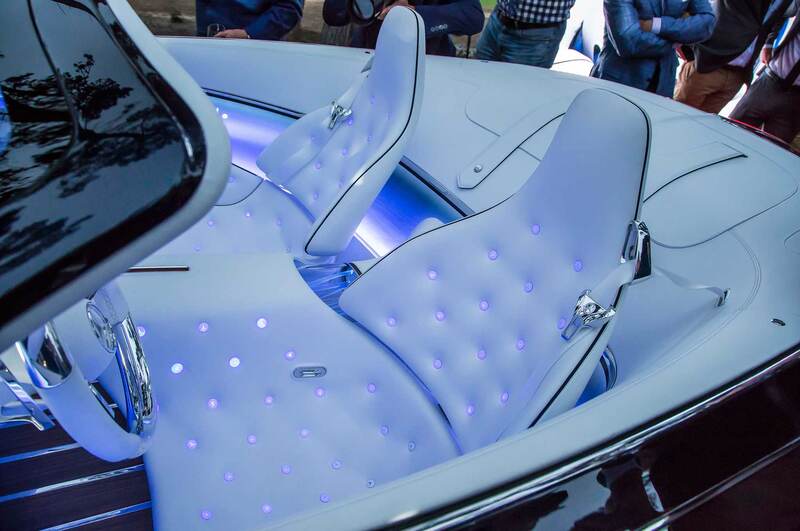 Inside, the two-seater welcomes lucky occupants aboard with crystal white Nappa leather seats, rose gold trim, and blue pulsating lights. 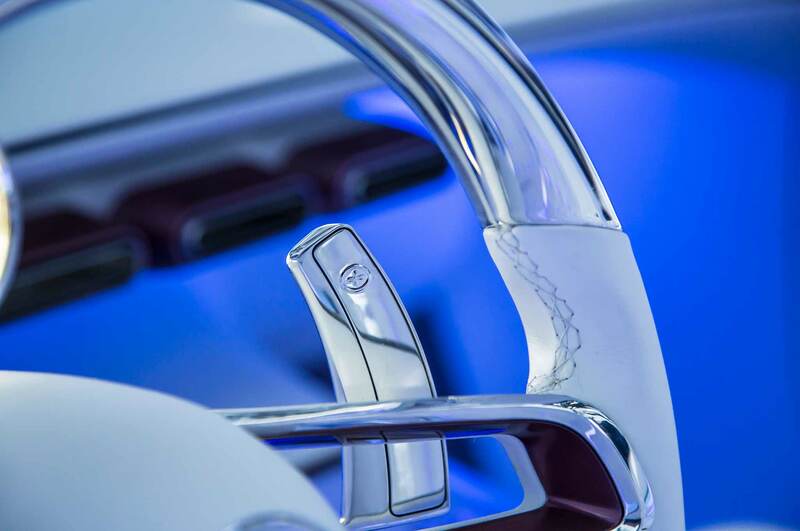 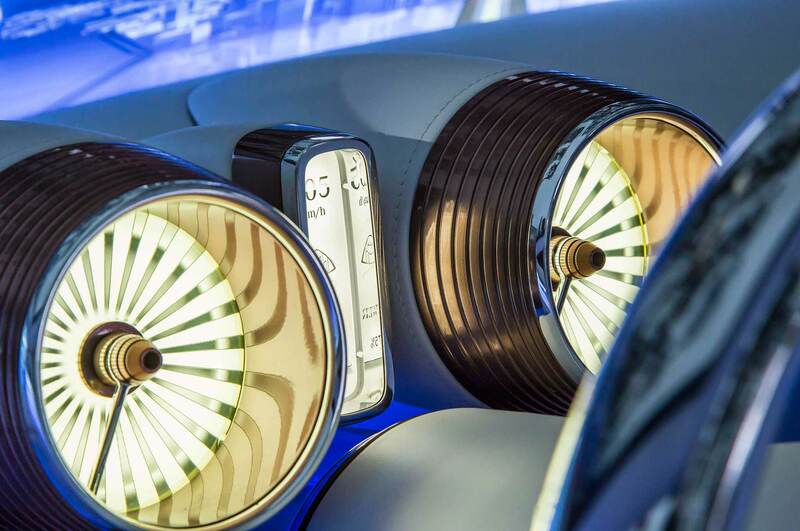 The seat’s small buttons feature illuminated Mercedes stars backlit in electric blue. 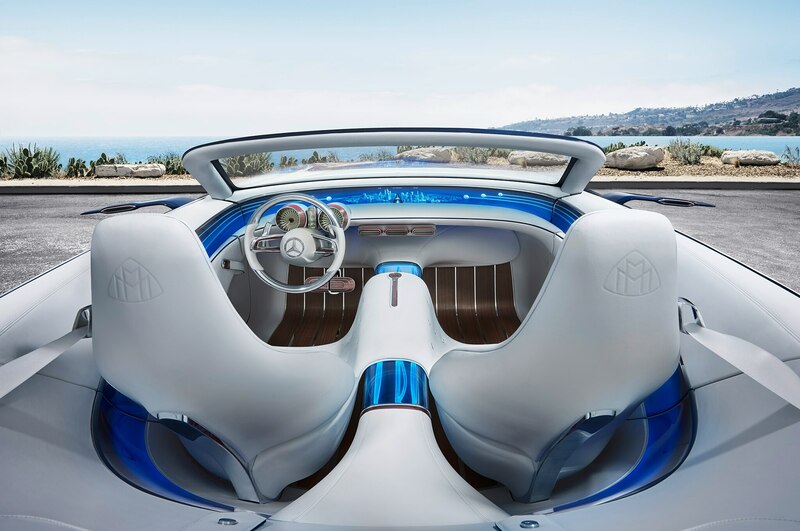 “A light wing flows in a curve across the door trim and the center tunnel into the seat landscape, creating a 360° open-air luxury lounge,” says Mercedes. 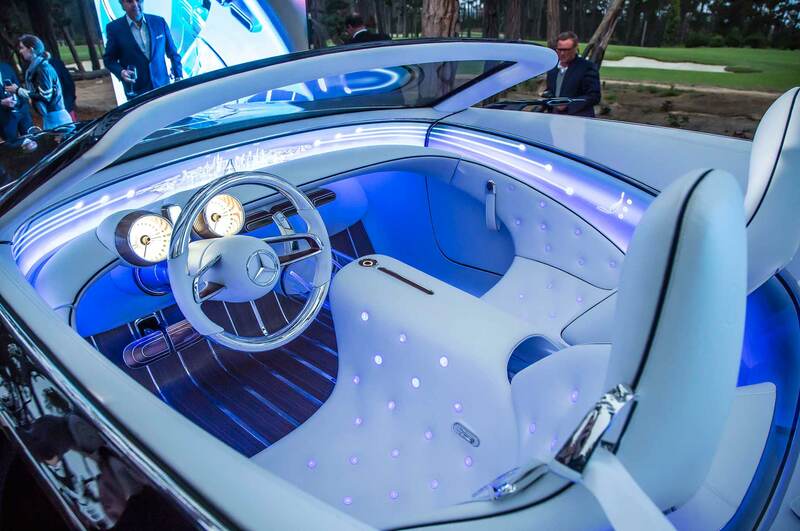 Instead of carpets, the open-pore wood floor features inlaid aluminum, like a boat. 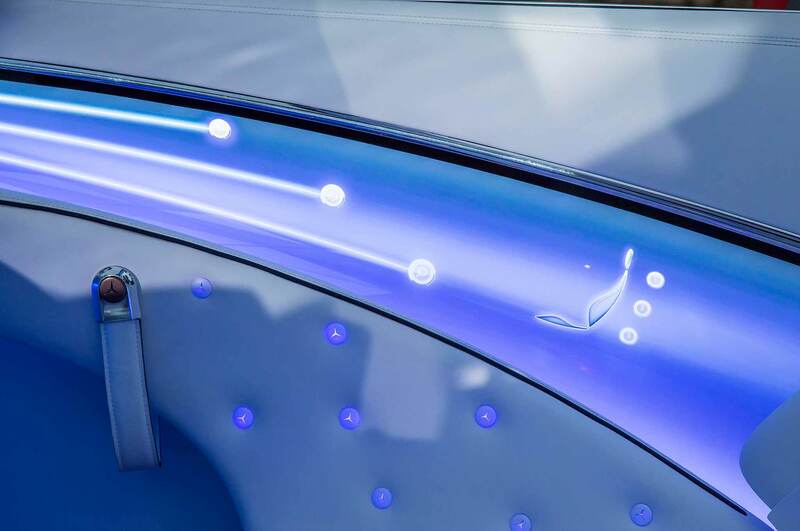 Seats are separated by a floating, transparent center tunnel, “which visualizes the drive system’s electrical energy flow for the passengers by means of blue fiber optics,” according to Mercedes. 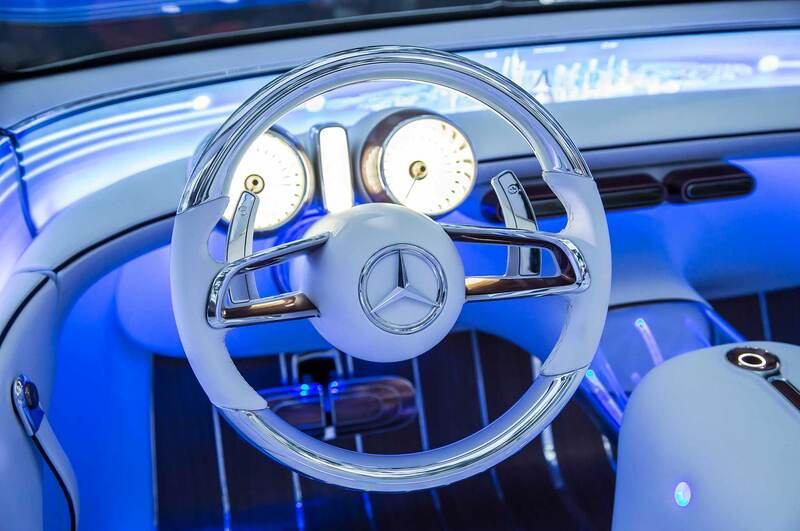 Classic round dials with needles are featured for the instrument cluster on the dash, along with two modern head-up displays. 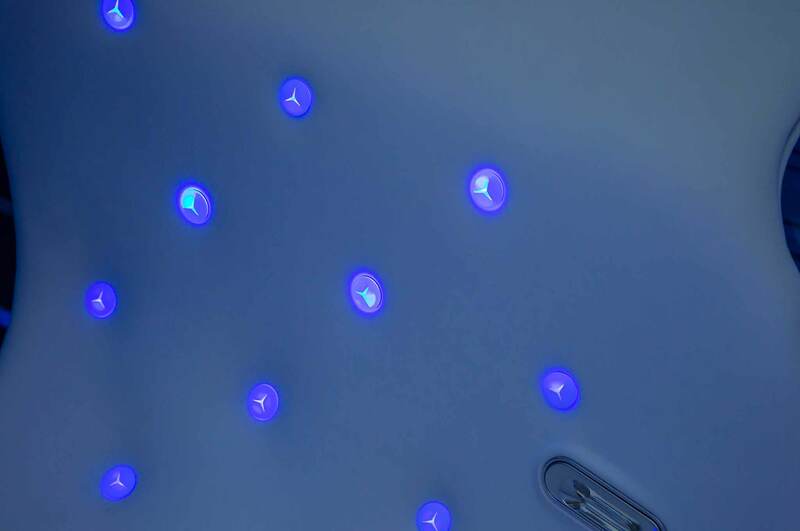 Biometric sensors record the state of mind and health status of the passengers we are also told. 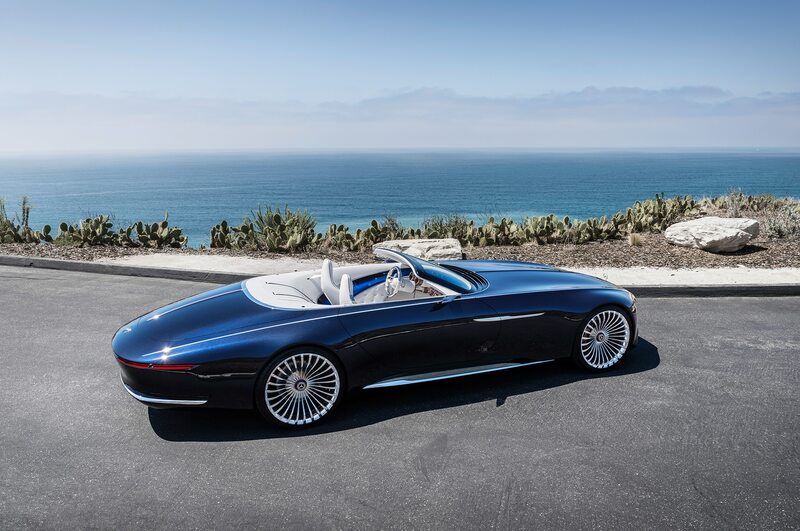 The Vision Mercedes-Maybach 6 Cabriolet will be limited to 300 examples worldwide and pricing has yet to be announced at this time. 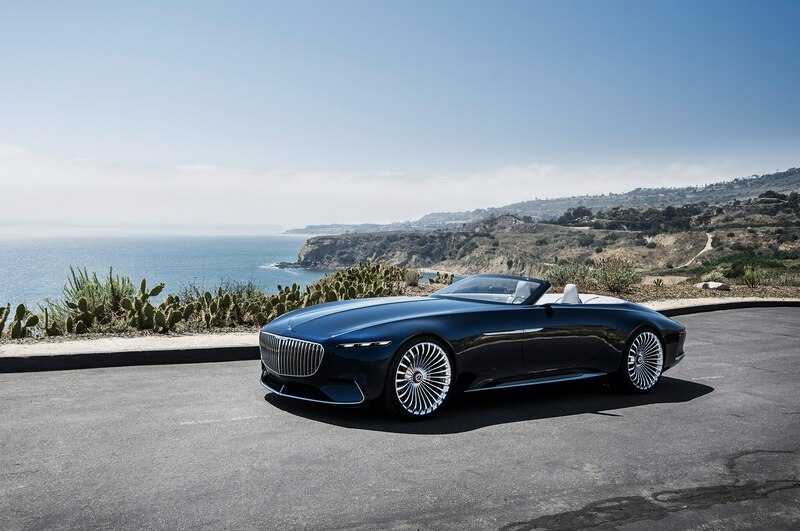 It will be on display at the 2017 Pebble Beach Concours d’Elegance on Sunday, August 20.